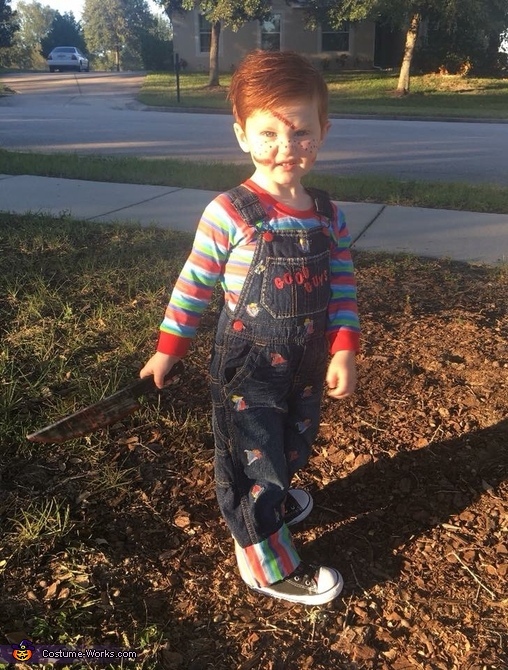 Asher is 2.5-years-old and was destined to play Chucky for Halloween with his red hair! Since he was a baby he had down the “Chucky face” where he scrunches up his nose. So after many friends and family telling us they were dying to see him as Chucky, we gave in! I ordered a basic pair of denim overalls off eBay and then removed all noticeable labels. I was able to find a fabric store online that carried a striped fabric I could use to sew a shirt that resembled Chucky, and a fabric that closely resembled the overalls (baseballs, hammers, Indian chief head dress, etc.) I then hand cut every single one of them and glued them to the overalls. It took quite a bit longer than expected lol! And then I put the “Good Guys” label across the front pocket and hand drew on white stitches across the front of the denim with a white fabric marker. Lastly for the overalls, I painted the buttons red and glued on cuffs at the bottom of the pant legs to match his striped shirt I made. Then all we had to do was put a couple fake scratches on Asher’s face and hand him a plastic knife and we had one, spot on looking little Chucky doll!